It started with a client that wanted pale blue. The fiber was wool; specifically cormo sheep wool. We had many discussions where I tried to explain the pale blue and indigo in production quantities would be difficult. Why? You need to mostly exhaust the thio vat and dye with what is left to get a pale blue. You could try to mix different concentrations of indigo but again, it is really hard to judge. I could get one or two skeins of the right color but not 5-10 lbs. I tried woad which is the right color but is is hard to come by and expensive. Fast forward a couple of years. 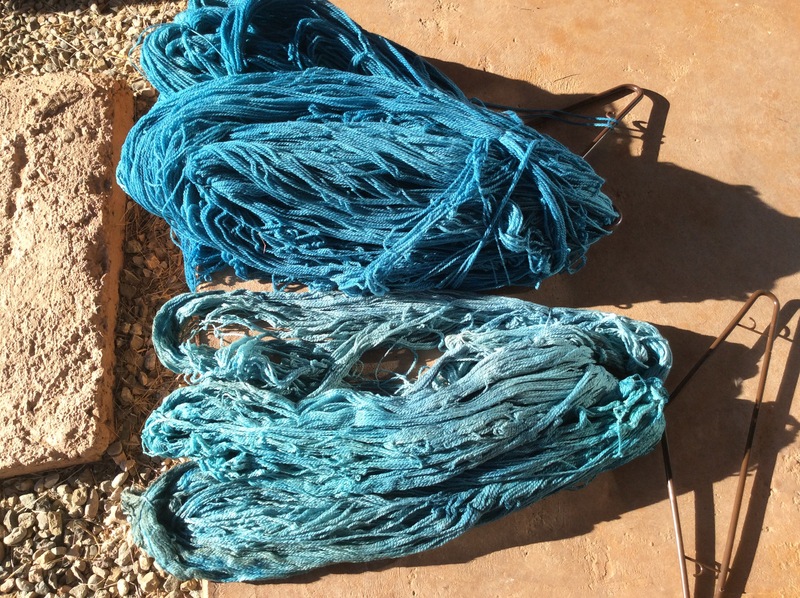 Fellow natural dyers Donna Brown and Catharine Ellis did some experiments with thio versus the 1, 2, 3 vat and discovered that thio accelerated the time it took to get indigo into solution. It was suggested that I try a 1, 2, 3 vat with minimal amounts of indigo. Donna and I did an experiment with 10 grams of indigo with the corresponding amounts of fructose and lime. We got, you guessed it, light blue. Now to try it with bigger quantities. I set up buckets, mixed a 1, 2, 3 solution with hot water, added warm water to the bucket, added the solution, mixed it all up and waited 8 to 24 hours depending on how impatient I was. I used a bucket with holes in it inside the indigo bucket to keep the yarn off the bottom and left the throughly wetted out yarn in for an hour. I could dye 1 – 1.5 lbs per bucket and then had to remix. Most of the yarn was dyed at least twice. The thicker yarns were much more uneven and had to be dyed 3-4 times. There was no problem with the wool and the high ph. I believe that it is the high ph, heat, and thio which causes the wool to become harsh and dissolve. Further experiments relative to that issue are needed (heat the 1, 2, 3 vat and see if you have the same problem). There was also no problem dyeing the wool without heating the 1, 2, 3 vat. It was at room temperature. 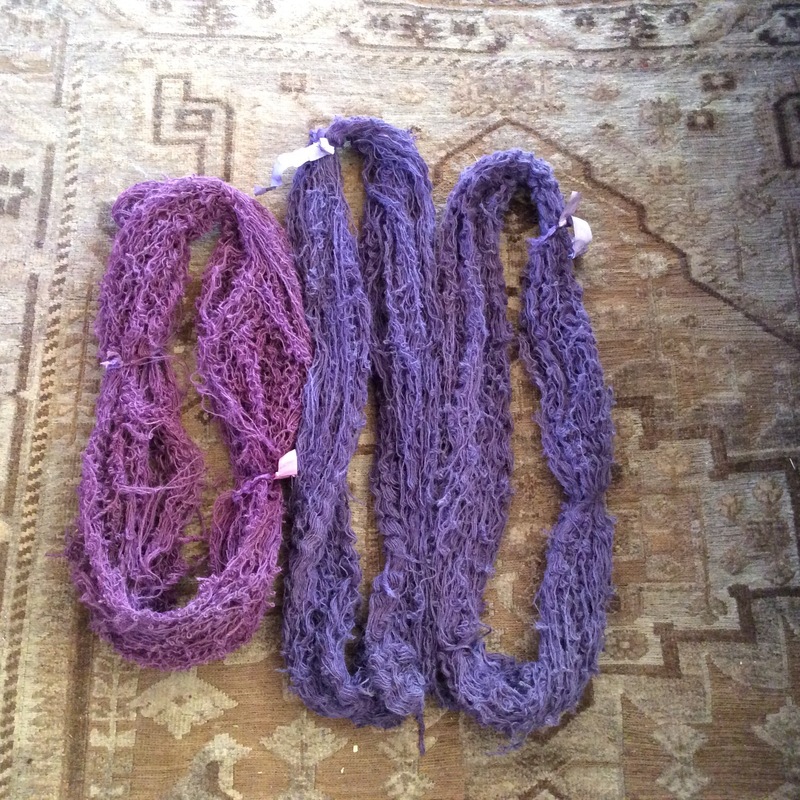 It was difficult to dye the skeins evenly, especially the heavier ones. They may benefit from constant movement as you would for a silk or cotton skein but I was hesitant to try that method as handling wool a lot does not usually work well. I tried using the water from an exhausted vat and refreshing the indigo. I got a lot of foam on the top, probably from too much lime. So refreshing the pot also needs some experiments. It may work to half the amount of indigo and use a thio vat but this is simple enough that it is worth adding to the tool kit. Catharine Ellis has a lot of useful information on her blog about the 1, 2, 3 vat. 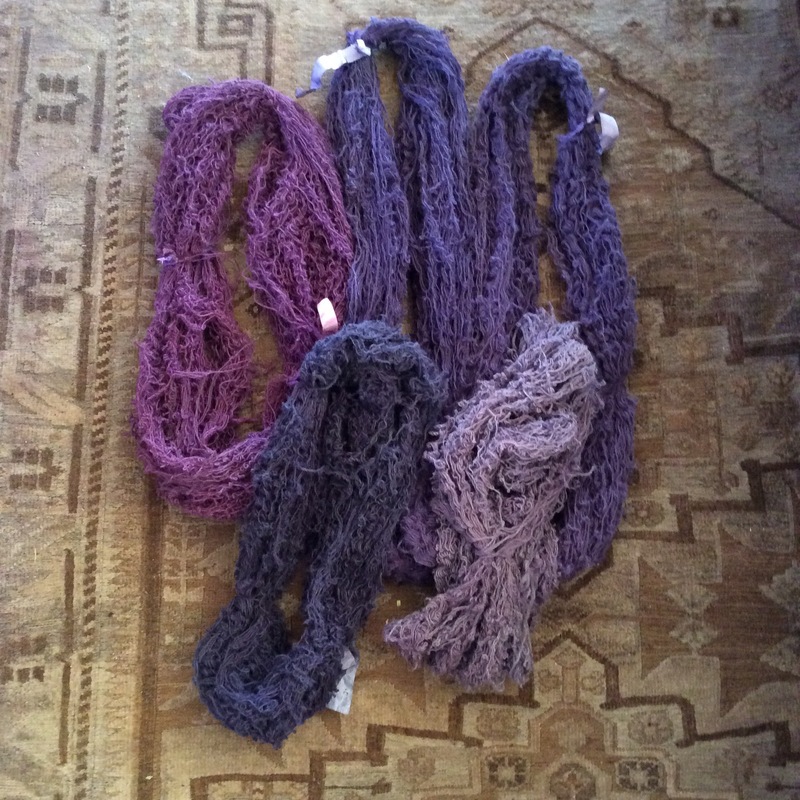 Heavier skeins were dyed multiple times to get even. 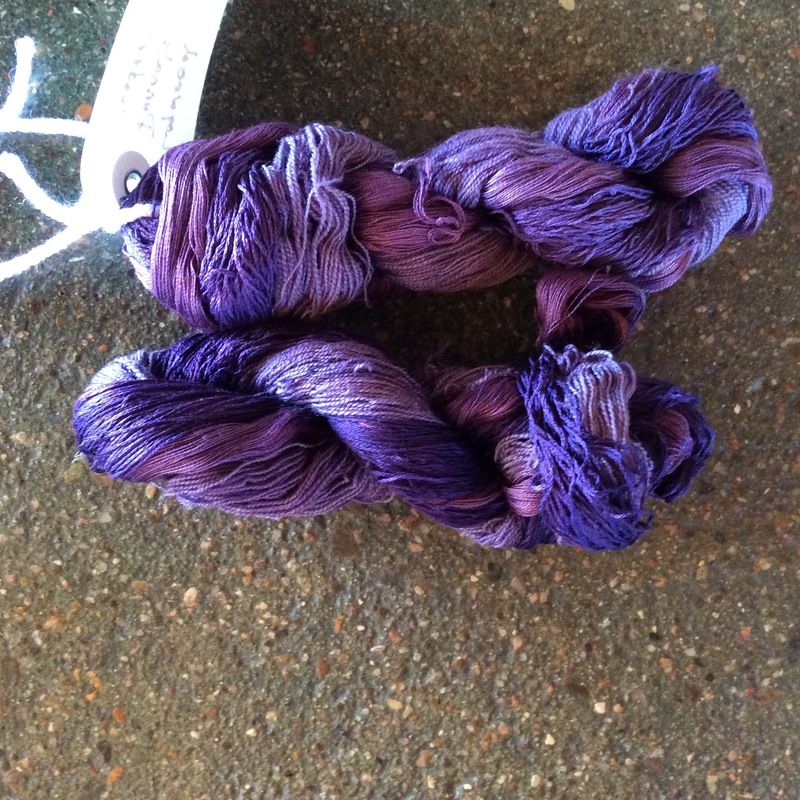 Light skein was dyed twice, third picture. 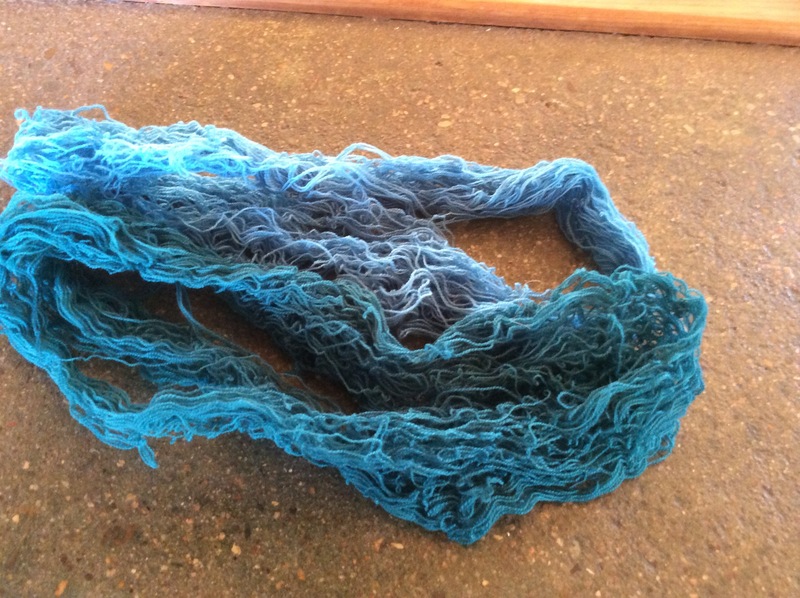 The primary natural dye used for blue is indigo. After looking through my shelves, I decided to do an experiment with anything that might yield a blue. The color was the primary focus of the experiment so light fastness, wash fastness, … were not considered. I just wanted to see the array of blues I had on the same material. The material is a felted wool mordanted at 20% potassium aluminum sulphate. 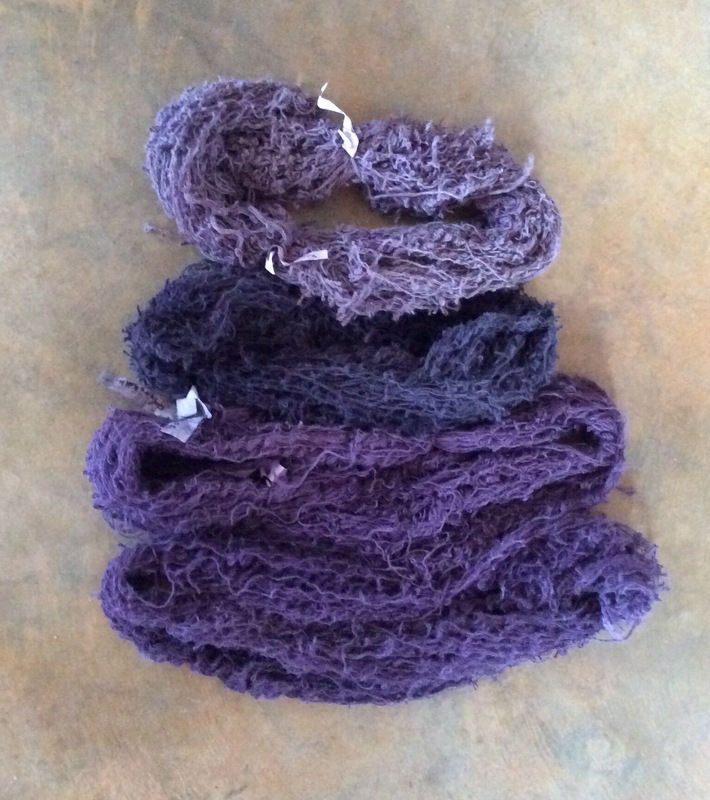 From left to right: indigo, navy blue (dye extract from Sam’s Vegetables in India), blue gardenia (liquid dye from Japan), Saxon blue, Caribbean blue (no longer available). Water is required for the plants themselves, the growing season is short, a fair amount of plant material is required if dyeing quantities of fiber, and there are a lot of rabbits that are voracious. It is possible to gather local plants in season but then one has to store them and I have allergies to a lot of the local options. The plant materials often require multiple dye extractions to get the most color from the plant; requiring yet more water. Most dye plants yield yellow. It is easier to develop and adjust repeatable recipes with extracts. On the negative side relative to extracts, one doesn’t know for sure if the dyes are extracted in an environmentally sound way and/or from plants or bugs that are not a limited resource. One has to trust the dye extract supplier. There is also the great satisfaction one feels when using plant stuffs that are locally grown or gathered. 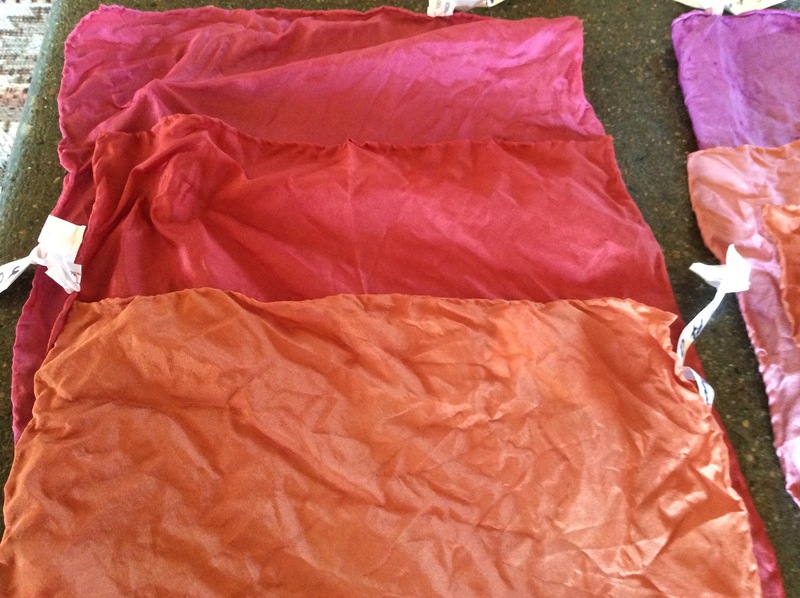 As I enjoy experimenting, each year time is set aside to try plant material dye stuffs. 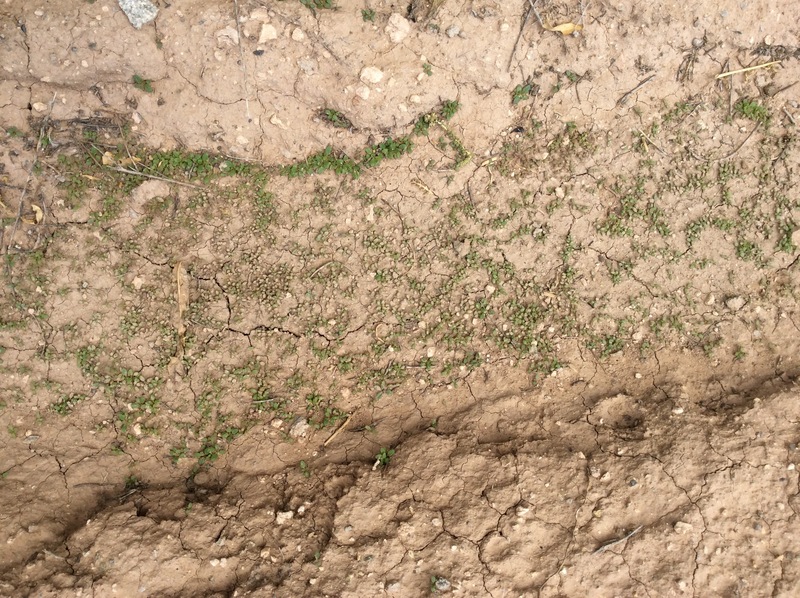 This year, some weld managed to survive the rabbits, drought, and hail. Last year, the same plant gave less than stellar results but it was worth another try. 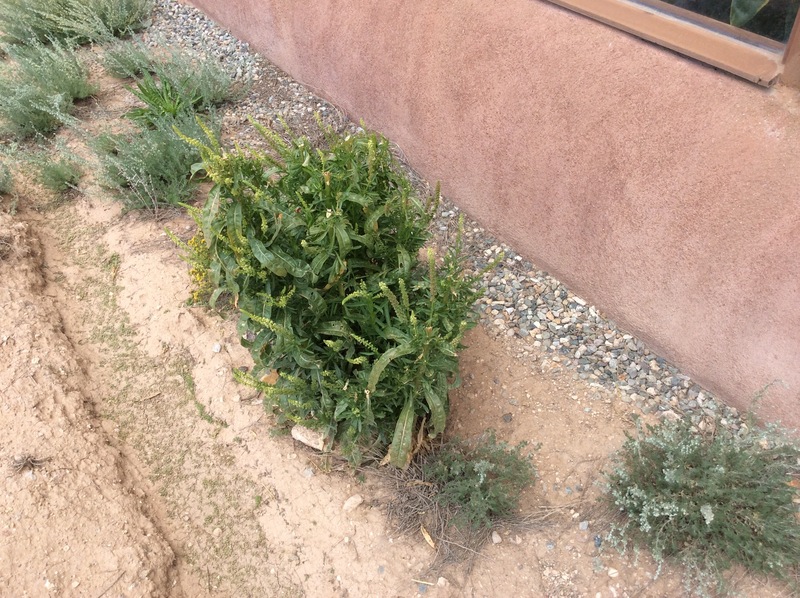 The stalks and leaves were cut from the plant and the dye extracted. Soda ash was added to make the water alkaline. The result was must better than the previous attempt. As weld extract is expensive, I don’t often dye with it so in this case, the plant material might work out to be a good alternative. 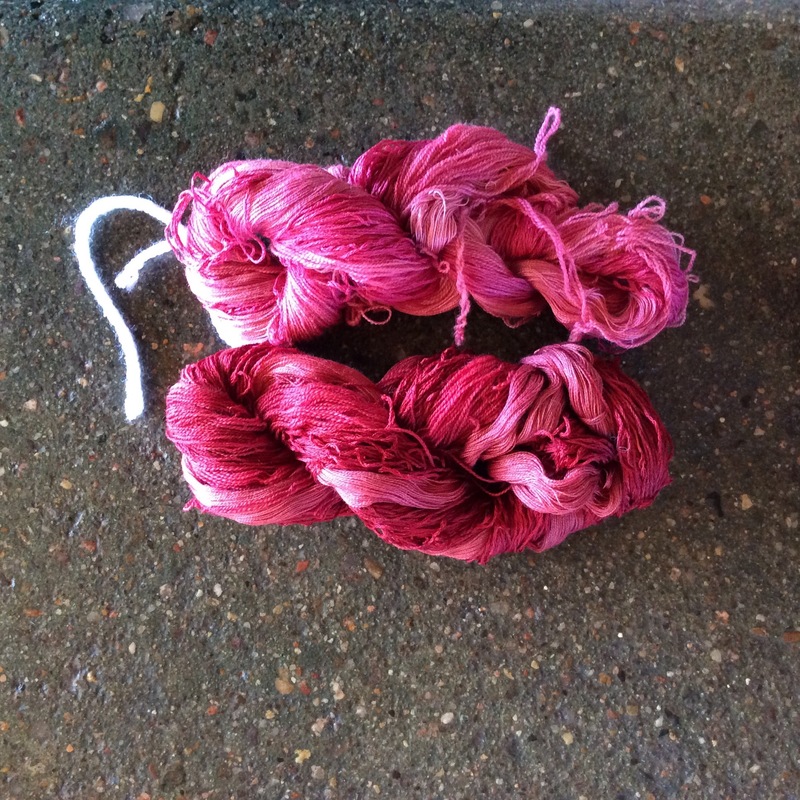 I have always had mixed feelings about using iron as a mordant when dyeing. Partly because it must be handled in such a way that the yarn/fabric doesn’t contaminate other yarn/fabric with loose iron before it is thoroughly rinsed and also because there is literature that indicates that yarn/fabric is damaged by iron. On the other side of the equation, is the idea from Charlotte Kwon that even small amounts of iron will help with lightfastness. I used 2% wog iron in the logwood experiments so as to mitigate the lightfastness issues with logwood but felt that I needed to have a better understanding of iron used as a mordant. Damage in historical textiles with gallic/iron pigment and/or tannin/iron dyes has been documented. Go to your local museum, look at historical textiles dyed with natural dyes, and see how well the blacks are holding up in the textile. I did some research and came across the following information specific to historical textiles. Tannin based dyes + iron will damage textiles due to oxidation and/or the formation of sulphuric acid. The sulphuric acid is formed with unattached iron. If the textiles are thoroughly rinsed, this is less of an issue as the unattached iron is washed away. It is also possible that some of the damage is due to high temperatures used in dyeing. Analysis cannot differentiate between heat versus dye damage. 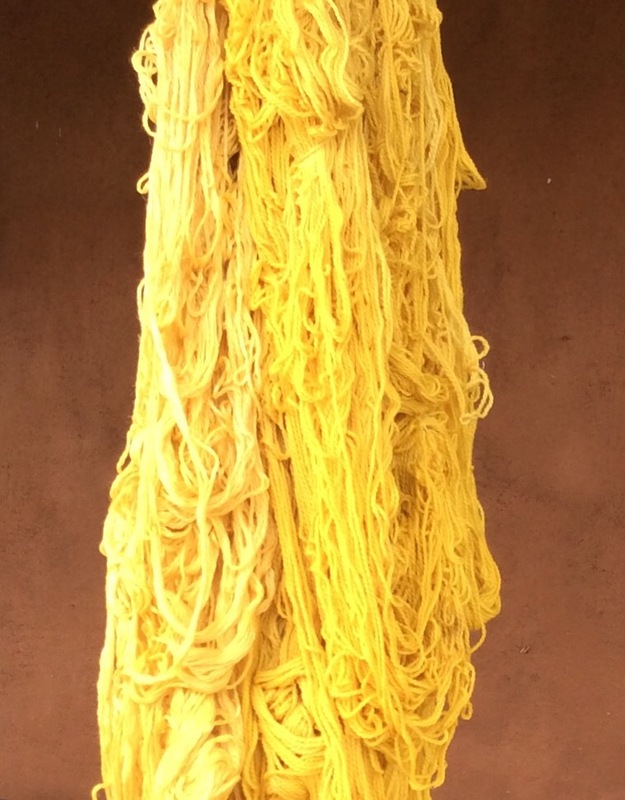 The Colourful Past: origins, chemistry and identification of natural dyestuffs discusses degradation of silk due primarily to the lack of regulation of silk dyeing. More iron was used in dyeing silk to get dark colors and the silk may not have been well rinsed. Wool dyeing was regulated; particularly with regard to the amount of iron that could be used and the dye process quality. Other sources conclude that tannin/iron damage is more of an issue with cotton, linen, and silk because the dye penetrates the whole fiber. The dye and iron are found through out the matrix. 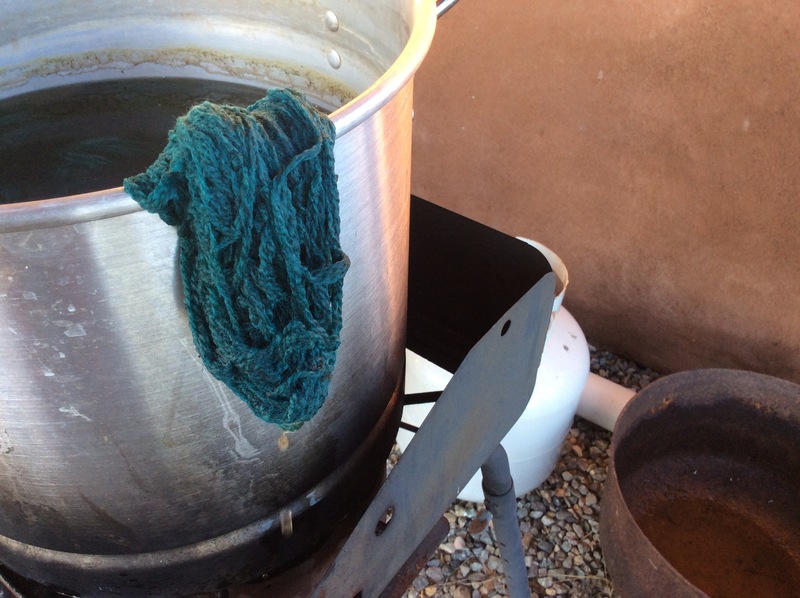 With wool, the dyes don’t penetrate the interior of the fiber. If one rinses thoroughly to get rid of any loose iron, then it is possible it will not be an issue. I came across another article in Dyes in History and Archaeology – Volume 16/17. The bottom line in this case is that iron and tannins cause the degradation. Iron used with dyes that do not contain tannins (madder for example) should be stable. The same paper suggests that the post treatment of an historic textile by an extract from the hinau tree which is a gallotannin will cause the binding of the loose ferric ions to the tannin and stop the degradation. Cardon says something similar – she suggests that the small amount of iron used with reds could also be a factor in the lack of degradation whereas more is used to get black. Conclusions? There hasn’t been a lot of research and tannin/iron dye degradation. The research does suggest that if the yarn/fabric is thoroughly rinsed and the iron % is not high, it is not an issue. It also suggests that iron can be used safely with non tannin based dyes. I did not find any studies on lightfastness with iron mordants; I imagine that is the next area of exploration. This is all book theory. If one is not creating art work for posterity, it is non-issue. If one is, more tests are in order. This project has been on the list for a while. I chose a lace pattern called Kodama http://www.ravelry.com/patterns/library/kodama-2 that I thought would work for painting. The yarn used is Zola from Treenway Silks. The shawl was knit and then mordanted with 20% potassium aluminum sulphate. It was blocked after mordanting and then painted with dye extracts. I debated about using a thickener and then chose not to but painted the shawl wet to minimize the transfer of color from one section to the next. Colors used: logwood, madder, Osage orange, carribean. The shawl was steamed after painting and then rinsed. Table Rock Llamas got in some new dye extracts; Lac, Logwood, and Mexican Logwood. 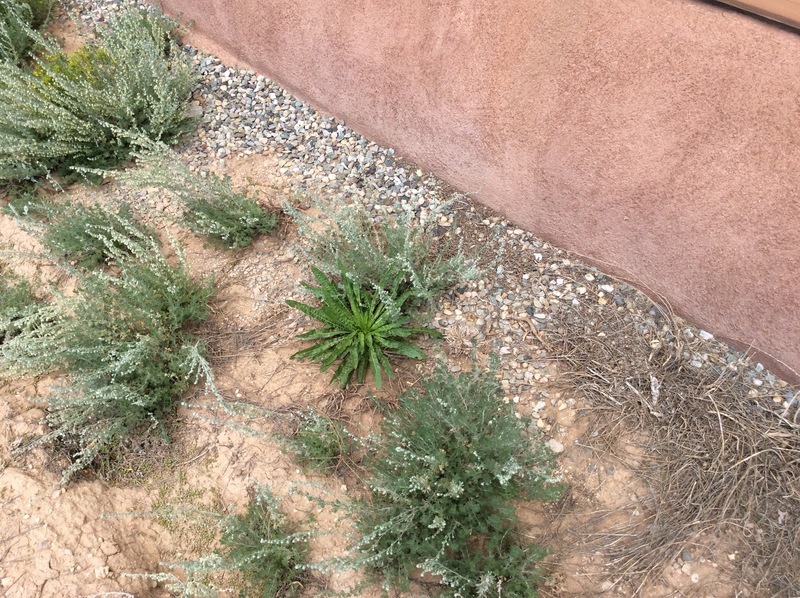 A colleague and I tested them in her water (Denver City water) and mine (roof collected water). We dyed sample skeins of cotton, silk, and wool mordanted with alum or in the case of cotton, the tannin, alum combination. The Logwood sample was very similar. That is interesting as usually I have problems with logwood extract but in this case, the water was clear after I dyed which is a nice change. The Denver city water is at the top. My colleague had been told that the Denver water changed a little while ago. I am sure what was added but it makes a color difference. On the Lac, I got darker results on the wool, lighter on the cotton, and redder on the silk. For the Mexican logwood, I got redder results on all fibers. Some additional experiments with logwood. I tried logwood chips and chalk (not much change) and logwood extract, cochineal and iron. All alpaca was mordanted at 25%. 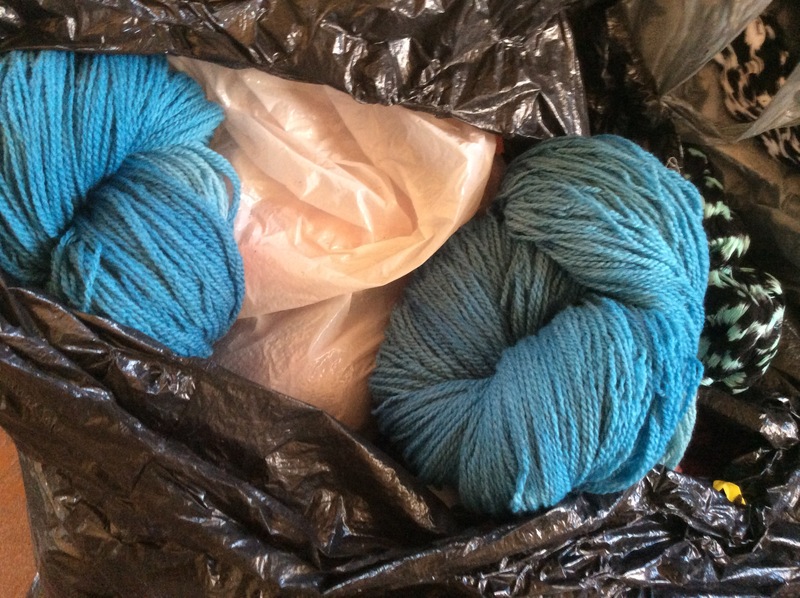 The chips and chalk is the middle skein in the photo below. The logwood and cochineal on the right. All of the skeins are in the next photo for comparison. See the previous post for information on those skeins. 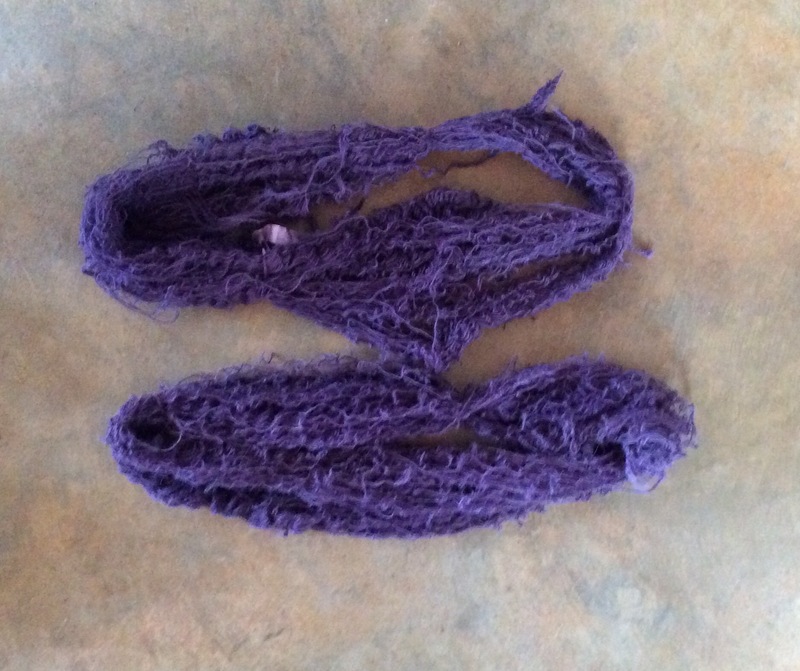 I was asked to dye some alpaca a dark purple. My usual recipe is indigo, mordant, cochineal but there always seems to be some discharge with the cochineal; even when the skein is neutralized in vinegar and mordanted after the indigo so the skein is pale. 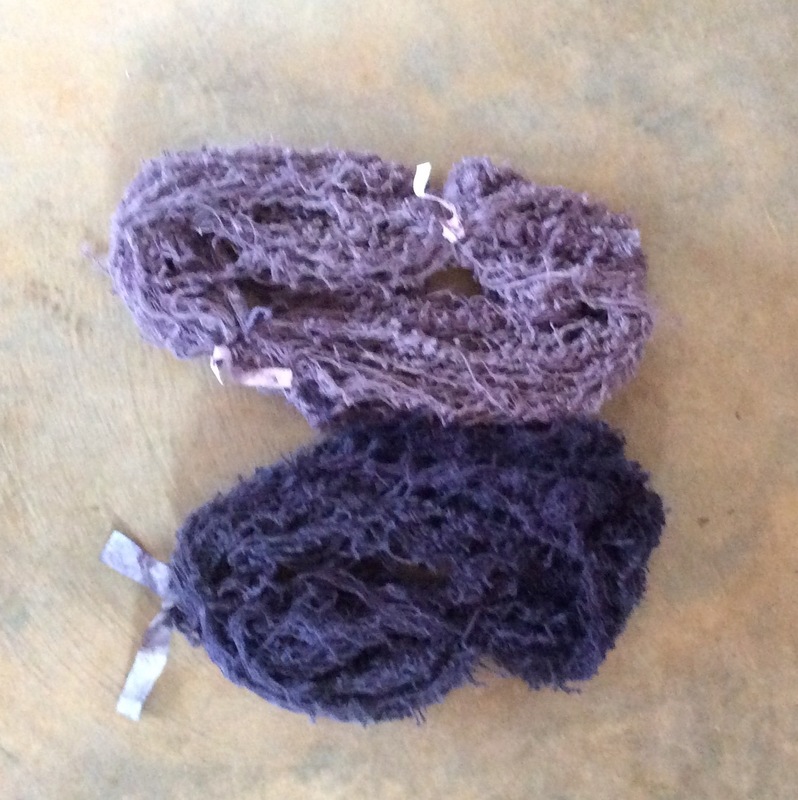 Logwood is another option so the following are skeins of alpaca dyed with logwood. All skeins are mordanted at 25% potassium aluminum sulphate as alpaca seems to do better with a higher % of alum. Cream of tartar was not used as some references say that logwood goes towards brown with cream of tartar. Logwood extract from Table Rock Llamas at 4% was used for two skeins. Logwood chips at 20% was used for two skeins. Boiling water was poured over the logwood chips and the pot was set aside for the night and used in the morning. Logwood likes hard water so 5% chalk was added to one dye pot with the extract. One of the skeins with the chips was dyed in a 10% walnut extract dye bath. Conclusions; in my water (roof collected rain water) chalk makes an appreciable difference. The tannin did not seem to make much of a difference. Logwood extract at 4%; skein that had chalk added is on the bottom. Skeins with logwood chips. Skein with tannin is on the bottom. Other things to try: mordant, dye, oxidize, mordant, dye. Some sources say that logwood is like indigo and is better in layers. Use tara as the tannin as logwood works better with that tannin than walnut. Add chalk to the chips. A couple of years ago, there was an article in Spin-off Magazine about some extract dyes from a company in India; Sams’ Vegetable Dyes. Two of them were said to be extracted from indigo. The extraction method is proprietary but as oxalic acid is listed on the dyes; presumably it is similar to that used for saxon blue with sulfuric acid. I experimented with the dyes on wool (10-12%) weight of goods. The yarns are mordanted. The smaller skeins at 10% wog potassium alum sulfate; the larger skeins with 20% potassium alum sulfate and 5 % cream of tartar. The reason for the difference in mordanting is the subject of another post but the wools are different; test wool skeins versus cormo wool and require different mordanting strategies. I did not add anything other than the dye to the pots. A comparison between the navy blue and caribbean ( the latter was painted so a bit light). 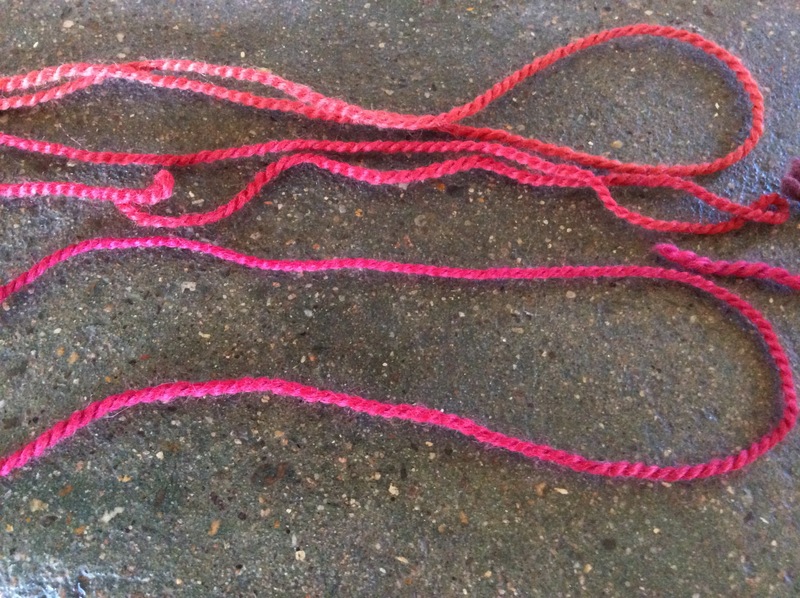 I did a few experiments to see if I could get scarlet with cochineal and a yellow as straight cochineal even with an acid modifier does not get you there. The silk and wool were mordanted separately with 25% potassium alum sulfate. The recipes were cochineal and Osage orange 10%, cochineal 10% Osage orange 5%, cochineal 10%, Osage orange 2%, a separate experiment with calcium nitrate, cochineal 10% quebracho yellow 10%, cochineal 10% Himalayan Rhubarb 5%. The cochineal was powder from bugs. The most successful was cochineal 10%, Osage orange 5% on silk. 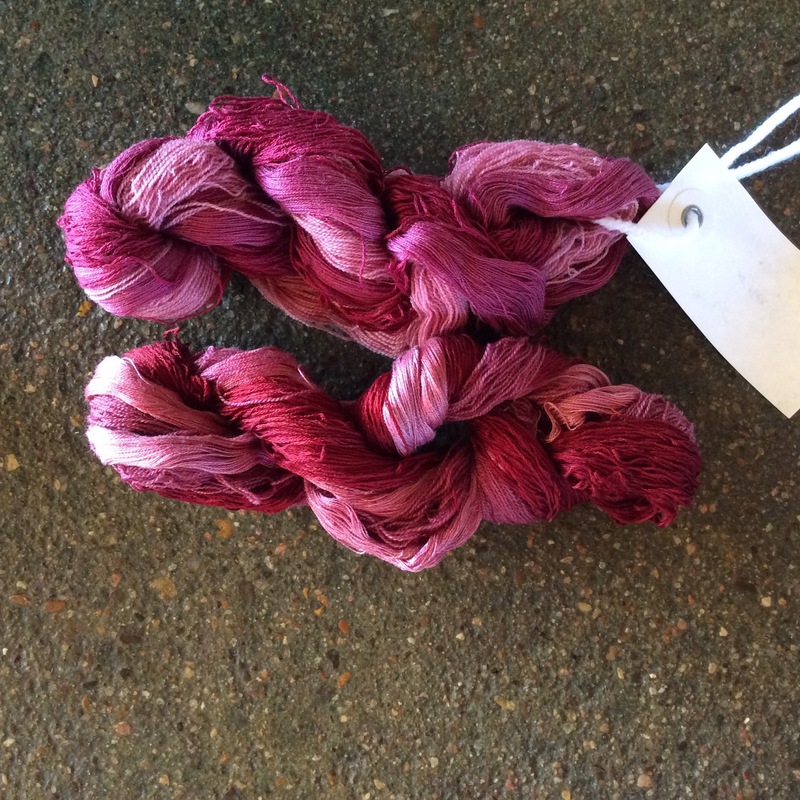 I also liked the cochineal Himalayan rhubarb on wool. Below are the Osage orange variations. The top one is the the one with the most Osage orange; bottom one with the least. And, the calcium nitrate experiment, quebracho yellow, Himalayan rhubarb, top to bottom.